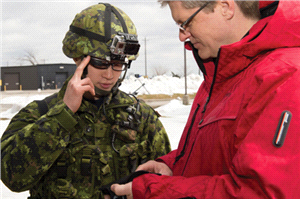 Visual/head-up display (HUD) and embedded computing technologies will dominate the wearable technology domain for the foreseeable future as militaries strive to improve situational awareness (SA) for soldiers, sailors, airmen and marines through increased data throughput, local processing for analytics and prediction and improved visual/auditory/haptic interface and dissemination of both information and recommendations for action. This is one of the conclusions of Dr. Bruce Floersheim’s recent Wearable Technologies Markets and Technologies Forecast report. Dr. Floersheim foresees a rapidly evolving sector, totaling an a cumulative market of more than $3 Billion, with a CAGR of 29.0% over the coming decade. The original idea behind a HUD was to provide the wearer with the capability to see critical information displayed in the same forward-looking visual cone. Display of the information on the periphery of that visual cone allows the user to maintain situational awareness of what lies ahead during forward motion. It began with moving information from gauges mounted on a dash board to the front sight cone. This has evolved into display of infrared images overlaid on the view screen and information pulled from live feeds about conditions or status for objects recognized through geo-tags. The next steps currently underway include shrinking the hardware to be capable of wearing the display as a set of glasses or contact lenses and software development that would allow mixed augmented reality (MAR) views. MAR provides the ability to add virtual information in the form of 2D/3D objects and figures that Visual/head-up display (HUD) and embedded computing technologies will dominate the wearable technology domain for the foreseeable future as militaries strive to improve situational awareness (SA) for soldiers, sailors, airmen and marines through increased data throughput, local processing for analytics and prediction and improved visual/auditory/haptic interface and dissemination of both information and recommendations for action. This is one of the conclusions of Dr. Bruce Floersheim’s recent Wearable Technologies Markets and Technologies Forecast report. Dr. Floersheim foresees a rapidly evolving sector, totaling an a cumulative market of more than $3 Billion, with a CAGR of 29.0% over the coming decade. MAR provides the ability to add virtual information in the form of 2D/3D objects and figures that may be static or dynamic to augment the view allowing one to participate with a virtual scene overlaid on a physical setting.